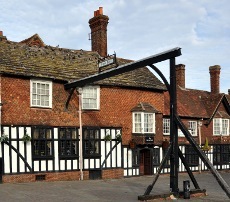 The George Hotel is a restored 17th century coaching inn on the pedestrianised part of Crawley High Street. The George is within a short walk of all the Crawley town centre shops, pubs and restaurants. The front of the George Hotel contains a blue plaque commemorating the author Mark Lemon, who lived nearby and had hosted editorial meetings of Punch magazine in the building.